The Form Settings are found in the plugin settings. On the left side you have the Form setup settings itself. Here you can adjust and configure the forms. On the right side is a preview. 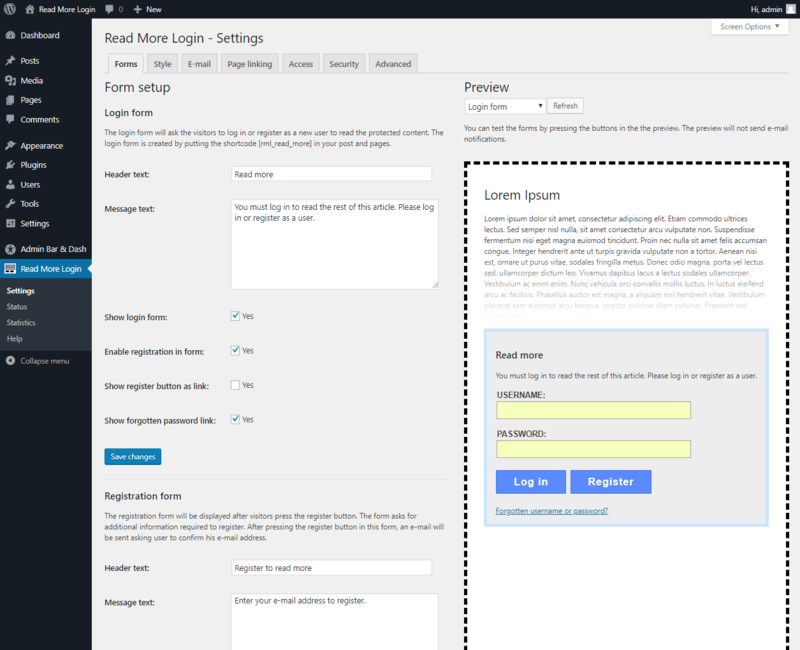 After you make a change to the Form setup, you can see the effect in the preview. You need to Save changes and refresh page to see the effect. These are the settings for the login forms. 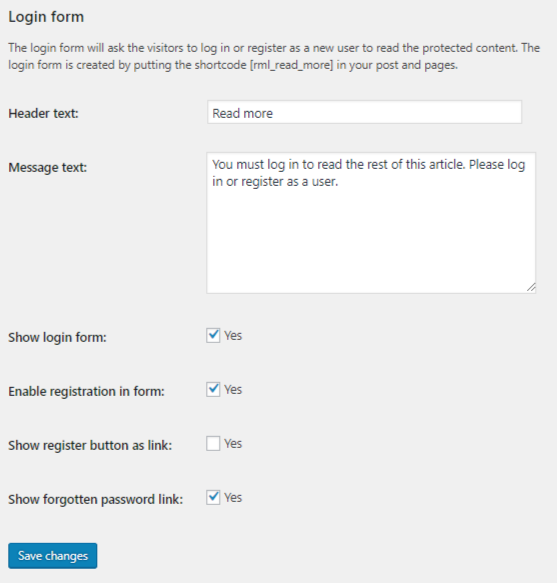 Header text – Login form headline. This field can include variables. Message text – Login form’s message to visitor. This field can contain html codes and variables. Note there are limitations to what html elements can be used. Show login form – Switch off this to hide username and password inputs, buttons and forgot password link. Only Header and Message text will show. Enable registration in form – Switch of to hide Registration button and links. Show registration button as link – Switch on to replace the Registration button with a registration link. The link will send you to the page given in the Page linking settings. Show forgotten password link – Switch off to hide that link. These are settings for the registration form. When pressing the Register button in the Login Form, this form will be loaded. 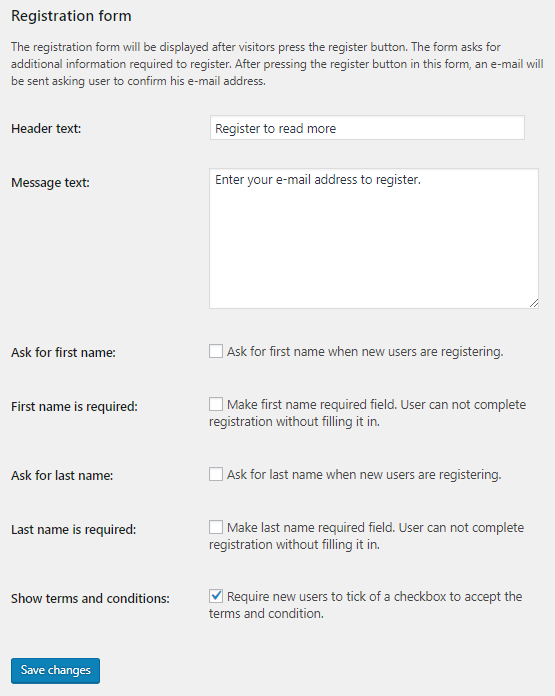 Header text – Registration form headline. This field can include variables. Message text – Registration form’s message to visitor. This field can contain html codes and variables. Note there are limitations to what html elements can be used. Ask for first name – Switch on first name field in the form. First name is required – Make first name required field. User can not complete registration without filling it in. Ask for last name – Switch on last name field in the form. Last name is required – Make last name required field. User can not complete registration without filling it in. Show terms and conditions – Switch on checkbox which user must tick of to accept the terms and conditions. A link to a page showing the terms and condition. The page link must be set in the Page linking settings. 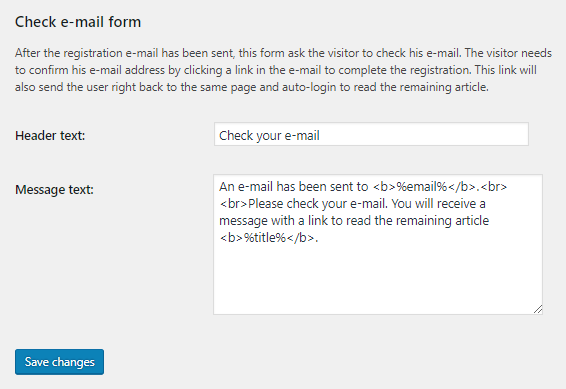 The Check e-mail form will show after the user has pressed the Register button in the Registration form. The text message in this form will ask the user to check his e-mail and click the verification link.